Kamlesh Patel has conquered physical disability to become a wonder dancer. Paralysed in both legs, he overcame great hardships to become a performer and was one of the star performers on a dance reality show last year. Rajul Hegde profiles his gritty struggle and amazing success. Continuing our series on Extraordinary Indians. The pride of Baroda, that is what many call Kamlesh Patel, a physically handicapped dancer who has given more than 1,000 performances in India and abroad. He maybe restricted because of his handicap, but what he has achieved due to his determination is an inspiration to many. At the age of 5, Kamlesh fell ill. The local doctor gave him an injection but by the time the boy returned home, he couldn't walk. "I just collapsed," remembers Kamlesh. His panic-stricken parents took him to another doctor where they were told that a major nerve in his body was damaged. Both his legs were paralysed because he was administered the wrong injection. A few years later Kamlesh was operated upon in Bangalore and Vishakapatnam, but there was no improvement. "I think it was God's wish that I remain handicapped. He wanted to send a message through me to all handicapped people what mental strength and passion can do to an individual," says the man who was the star of television reality show, Dance India Dance last year. In school, other children made fun of him and Kamlesh felt sad about his disability. "They looked at me as though I was a specimen. I would get nervous and disturbed when I looked at other handicapped people. I just wished that I could do something for handicapped children so that they could be motivated and inspired by me," says Kamlesh. His parents were keen that he complete his graduation and take up a job. They remained worried about him and did not want him to be a burden on anyone when he grew up. "They knew that dance was my passion from childhood, but felt that I couldn't make it a career since I was not a normal kid." Though he completed his graduation in commerce, his interest lay in dance. "To become a good dancer I needed two legs, which I didn't have, but I had faith in God." Passionate about dance, he would longingly look at those who performed during the Ganesh festival celebrations in his area. Nobody included him in their dance group because of his disability, so while watching others, he would sway to the music. "I was in my second year of BCom and while doing Ganeshji's seva on Ganesh utsav, I just sat in front of Ganeshji and asked him -- 'I have been doing seva for so many years. I have heard that when God takes one thing he gives four in return. So why don't you show me a way to dance without my feet?'" "A miracle happened at that moment," Kamlesh recalls, "I suddenly put both my legs around my neck, balanced myself on my hands and started walking. I thought I could dance with my hands!" Perched on his hands, Kamlesh gingerly did a few steps to everyone's surprise. And that how his career began. After that Ganesh festival, he joined dance classes for two weeks in Baroda. His teacher Manu Thapa was hesitant about teaching him but after seeing his dance movements, he promised to teach him different forms of dance. Kamlesh didn't inform his parents, he would tell them he was going to computer classes and attend the dance classes instead. "Some kind friends would take me to the classes and drop me back home." "Manu Sir was so impressed with my dance that he organised a show for me. People loved my performances and it was a super hit." Soon after, he slowly started getting calls from event management companies offering him shows. He started by performing in small places and then moved to towns and then to the big cities. His parents also came around and encouraged his passion for dance. But it wasn't easy at all. Kamlesh -- who didn't even have a wheelchair in primary school and was carried to his class by his mother -- had to continue his struggle. He waited in long queues at bus stops irrespective of the season for his performances. Neither was it easy learning to dance on his hands. His personal battle against disability and his long struggle to find a niche for himself finally bore fruit last year. Kamlesh's big break came after he auditioned for Zee TV's Dance India Dance show in Ahmedabad. During the audition, the show organisers were unsure if Kamlesh should be included in the competition because unlike others he danced on his hands instead of his feet. "But Remo D'Souza, one of the judges on the show, said as long as I could dance it didn't matter whether I was dancing with my legs or hands." 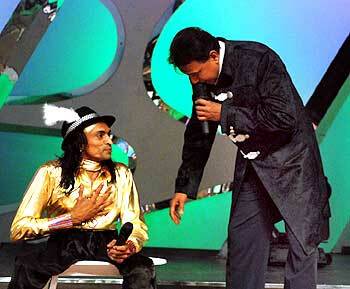 Kamlesh was selected and performed in Mumbai before actor Mithun Chakraborty, the judge of the show. His passion and commitment won the hearts of the audience and the judges even though Kamlesh was eliminated after a few rounds. "The judges told me that I was already a winner. That was the biggest compliment for me. I was specially flown in to be part of the Dance India Dance final, got a standing ovation and a salute from Mithun for my performance." Kamlesh has also appeared on television shows like Shabhash India, Boogie Woogie and as a celebrity guest on The Great Indian Laughter Challenge, but his participation on Dance India Dance opened many doors. "Now people ask me for autographs. I feel so good from inside that I cannot express it in words. Those who made fun of me look up to me now and I have also forgiven them." Kamlesh does charity shows and donates 50 per cent of his fee to a handicapped organisation. "If the show is organised for the welfare of disabled children then I do it free." On an average he get 5, 6 charity shows a month apart from other shows. "If any disabled person comes and ask for any kind of help, I help them without thinking." "A couple of years ago I had gone to the UK for a charity show for a disabled organisation. A lot of people came up to me after my performance and said they also felt like helping. In another incident a disabled lady in Lonavala hugged me after my performance. Later I came to know from her relatives that she had not moved for many years and it was a big surprise for them when she came and hugged me"
"I get my strength from God. My main aim is to motivate disabled people. Even if 10 per cent of handicapped people get inspired by me I feel my mission is accomplished"
He feels the government should take the lead in helping the disabled, provide them with counselling, help them identify their strengths to find jobs and live a respectable life in a society. Kamlesh now makes a reasonable living by peforming in dance shows. "By God's grace I have started earning enough to take care of my family." He recently bought a car. He will choreograph two songs for a Tamil film and has started getting offers after Dance India Dance. Manzilay un ko milti hain jin ke sapnon mein jaan hoti hai. Pankho se kuch nahin hota Hauslay se udaan hoti hain (The utimate goal belongs to those who have the will to power their dreams/It is not the wings but determination that makes one soar to greater heights).